In the middle of St Peter’s square in Rome, there stands a great obelisk. You definitely can’t miss this imposing structure. It is the oldest manmade structure that predates the present basilica and its predecessors. It is about four and a half thousand years old and it originally stood in the temple of the sun in the Egyptian city of Heliopolis. However, it was brought to Rome by the dreadful Emperor Caligula and it was set right in the middle of Circus of Nero, equally dreadful that, that was on the Vatican hill. It was in that Circus that St Peter was martyred and the obelisk may have well been the last thing on this Earth that Peter saw. One could add that it may be the sole existing object that stood witness to the martyrdom of St Peter, a relic of pagan origin. On top of the obelisk, there now stands a cross. In ancient times there was a gold ball representing, of course, the sun. Now, there is a cross, the cross of Christ! On the pedestal of the obelisk there are two inscriptions. The first in Latin, “Christus vincit, Christus regnat, Christus imperat”, which translates as, “Christ has conquered, Christ now rules, Christ now reigns supreme.” The other inscription draws inspiration from the Old Testament, “The Lion of Judah has conquered”. So here we have the language of victory. A symbol of pagan Roman imperialism and triumphalism has become the symbol of Christ’s triumph. Christianity has triumphed by the power of the cross, and triumphed, even over the greatest power that the ancient world had known, the Roman Empire, and here in the middle of St Peter’s square stands the obelisk baring those triumphant inscriptions. Today, each of us stands as a monument to this seemingly impossible truth: Christ has triumphed over death! Christ has risen from the dead! And because He lives, we who know Him shall also live. In the resurrection, Our Lord conquered sin and death, and is alive forevermore. All over the world, churches are filled with worshipers because there is an empty tomb in Jerusalem. We worship a risen, living Saviour, who has promised to give immortality to all who believe in His name. No longer do men and women need to stumble in the fog and the darkness of hopelessness. A Light shines brighter than the noonday sun, offering hope to everyone who has been born again. That is the reason why the cross has replaced the golden globe at the pinnacle of the obelisk. It is a reminder of what the Lord promised, “I am the resurrection and the life. He who believes in Me, though he may die, he shall live. And whoever lives and believes in Me shall never die” (John 11:25-26). But in spite of this monument of death having been defeated, death continues to carry with it a certain dread. From the day that Abel was killed, people have dreaded death. It has been the enemy, the great mystery, that makes people quake with fear. We expect death, but we always have a glimmer of hope that medical science will discover something that will keep us alive a little longer. We have found a cure to almost every known disease. But as much as mythology often speaks of the fountain of youth and the elixir of immortality, we have failed to find a cure for death. Death stalks the rich and the poor, the educated and the uneducated. Death is no respecter of race, colour or creed. Its shadow haunts us day and night. We never know when the moment of death will come for us. Is there any hope? Is there a possibility of immortality? Well, today, the Church announces to the world, “We have found the answer! We have found the cure!” “Christ has conquered, Christ now rules, Christ now reigns supreme!” We travel back to the empty tomb on that first Easter morning and hear the voice of the angel speak to us as he did to Peter, the Beloved Disciple and Mary Magdalene, “He is not here; for He is risen” (Matthew 28:6). In the resurrection of Jesus Christ we have found the answer to the great question of the ages placed on the lips of Job: “If mortals die, can they live again?” (Job 14:14) All humans die. However, there is hope for those who rest in Christ. Just as Christ was raised from death to life, we too shall be raised! The greatest truth that you can ever hear is that, Jesus Christ died but rose again, and that you, too, will die but can rise again into newness of life. Scripture teaches the bodily resurrection of Jesus Christ. It is not a spiritual resurrection, as some would have us believe. The Lord’s very body was raised by God from the dead, and someday we will see Him. Christ awakening from the tomb is also our awakening. His resurrection from the tomb is our resurrection from sin and its consequences. The resurrected Christ also lives today in another very real sense: in the heart of every true believer. Though He is in His glorified body in Heaven, yet through the Holy Spirit He dwells in the heart of every Christian. The Scripture says, “Christ lives in you, and this is your assurance that you will share in His glory” (Cf. Colossians 1:27). So that now, our faces become the faces in which the resurrected Christ shows forth His beauty and His glory. Our eyes become the eyes of the resurrected Christ, to exhibit His sympathy and His tenderness. Our lips become the lips of the resurrected Christ, to speak His messages. Our ears become the ears of the resurrected Christ, hearing the plaintive cry of the world’s needs. 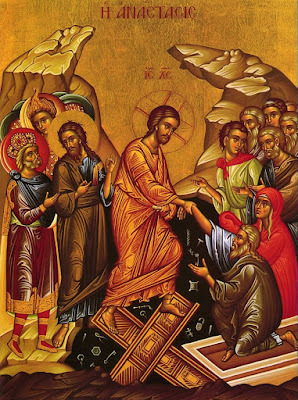 Yes, today, we remember the stone that was rolled away from the door, not only to permit Christ to come out, but to enable the faithful to go in. To people who faced the grave as the end of everything, death as the final barrier to all human hopes, was now broken. To people who were never sure that their prayers really reached God, the way to the Father, was now reopened. Because of Easter, every parting gives a foretaste of death, every reunion a hint of the resurrection. We shall see one another again, for death is no longer the final answer. He has risen! Easter reminds us that every Good Friday in our lives will have an Easter Sunday and that Jesus will let us share the power of His Resurrection. In short, the message of Easter is that nothing can destroy us – not pain, sin, rejection nor death – because Christ has conquered all these, and we too can conquer them if we put our faith in Him. “Christus vincit, Christus regnat, Christus imperat”, “Christ has conquered, Christ now rules, Christ now reigns supreme.” Alleluia!